This was to be our most difficult day of biking. It was the longest, it had the highest hills, and according to all the guidebooks, it would be the least interesting. I thought that there were two main parts of our overall trip, the first had consisted of interesting tourist cities -- Dinan, Mont-St-Michel, and Granville -- and other was to be the Normandy D-Day invasion beaches. However, in between these parts we had to cross the Cotentin penninsula to the northeast, about 90 miles to the beaches of Normandy. There wouldn't be much to see; it just had to be biked. In fact, in the trip planning I had a hard time deciding where to stay overnight on the penninsula, as there were very few cities that had hotels listed on the web or in guidebooks. I finally decided on the little town of Carentan, which was about 50 miles from where we were starting in Granville. It was a bright sunny morning again, and we debated how best to leave Granville to the north. We only had a poor quality tourist map of the city, and it didn't show where the hills were. The last thing we wanted to do was to bike down the steep hill from our hotel and have to bike back up again. So without a good plan we started out in the other direction, only to have to go back down the hill after all. We then took the main road out of Granville, which was fairly dangerous for bikes. Every block or so the road would "V" inwards with steep curbs, narrowing the passageway. If a car were passing just at that time, it was a very tight fit. We biked up a long, moderate hill in this fashion before deciding on a turnoff west towards the coast. The plan was to go downhill to a secondary road that led to the north. We had a little difficulty wending our way down and finding the secondary road that we wanted, but after a few wrong turns we happened on a road that we decided had to be the right one. Anyway, it was pleasant biking and going the right direction. After a while we did see signs that confirmed our choice. This now was wonderful biking. We had the road to ourselves, and it was level and interesting, passing through farms and tiny villages. Here's another view on this charming little road. Several times we came to intersections that weren't marked, or had signs to towns not on our maps. We took arbitrary turns, but always making our way north. After a dozen or so miles we joined D20, the main road towards to the north. No more wonderful biking. Here there was considerable traffic and quite a few large trucks. Moreover, the road got progressively hilly as we worked our way towards Coutances, the town at the midway point of our day's route. It seemed like we passed through a number of towns named "Mont-this" or "Mont-that" at the top of hills. 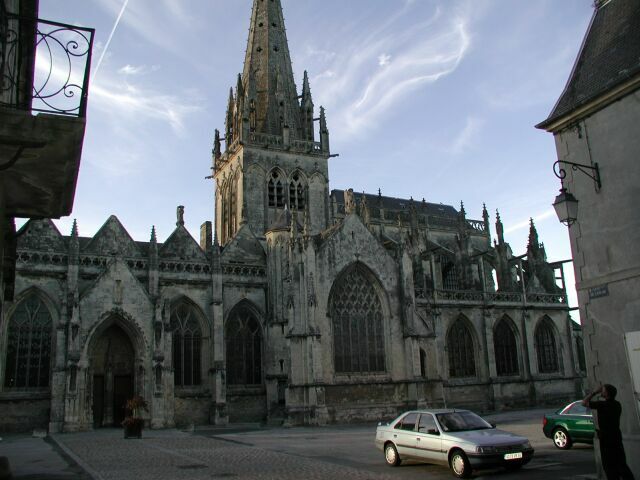 Coutances was a hilltop town with a large church that dominated the skyline. The town lay on the other side of a river, and we planned to take a detour along a small road that paralleled the river before crossing. First there was a steep hill to negotiate, and then we paralleled the river on a small farm road. 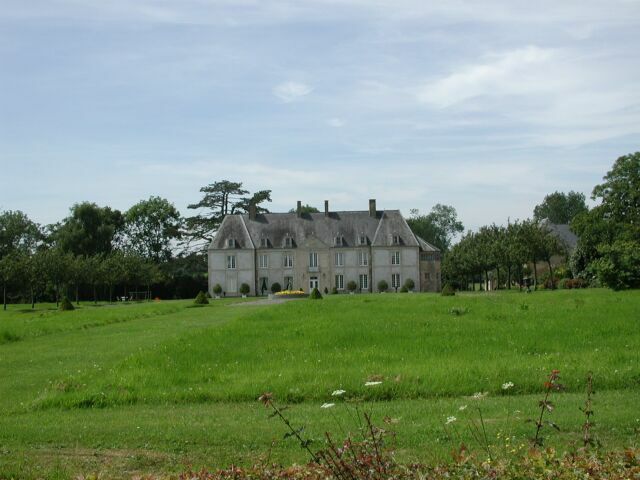 Right before we rejoined the main road towards the bridge to Coutances, we stopped for lunch. I had saved an apple and a small baguette from breakfast. I wished that I had more. After this short respite we coasted down the hill and crossed the bridge to Coutances. 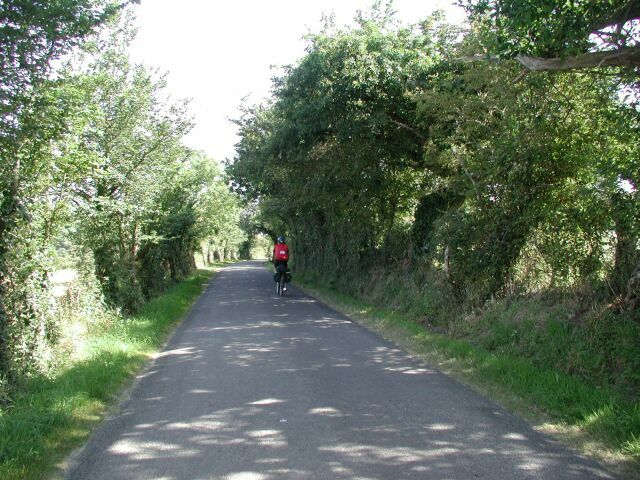 The highway led up the hill on the other side and bypassed the center of Coutances by a few blocks. It was a fairly steep, long hill, and at the top we stopped at a gas station for directions. I bought an ice cream cone, partly in payment for the directions. 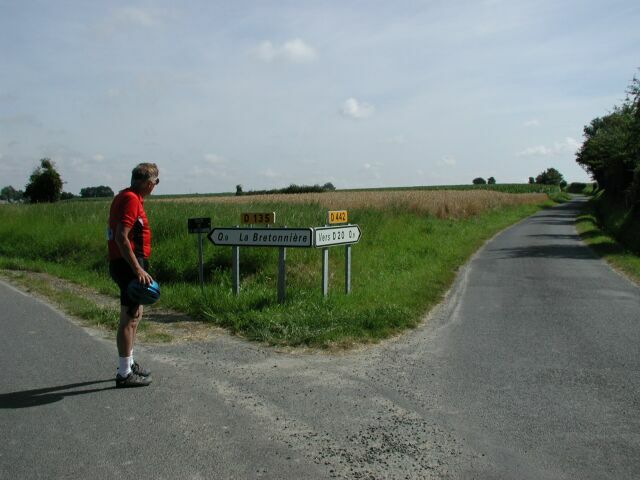 We were looking for a turnoff from the main highway to a lesser road that would take us northeast towards Carentan. The station attendant told us to pass through three roundabouts, and then we would see the turnoff. After the first roundabout, the road ahead didn't look promising, so we took an alternate path, but that didn't seem to work, so we went on, as instructed, to the second roundabout. After that I saw a terrible long, long hill in front of us. If this wasn't the right road, we were going to be in big trouble, and I didn't see a third roundabout. Len was already up ahead. The hill must have been at least a mile long, and as it was absolutely straight, I could see the length of it. Maybe, I thought, it would be better if the hill were curved, so I could be fooled into thinking that I would be reaching the summit on the next curve. That's what often happens on hills. 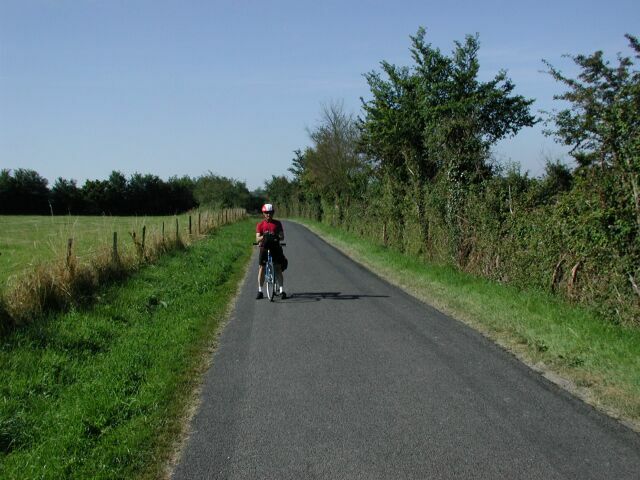 We had already gained considerable altitude in biking up to Coutances, but now there was more to be negotiated. But eventually we reached the top of the long hill, having gained 550 feet, and there was a roundabout at the top. 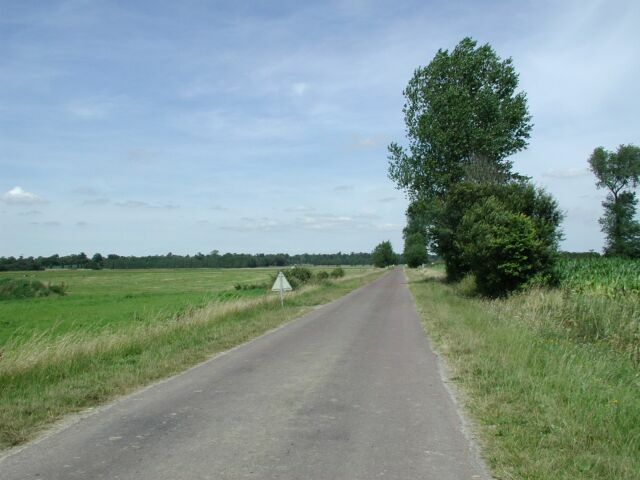 One of the roads emmanating from the roundabout was the one towards Carentan. It could have been worse -- at least we had been on the right road. After the turnoff, I thought we'd be through with the hills, but immediately there was another. There was another 100 feet of altitude to be gained, and then we reached the highest point of our trip. It would be all downhill from here. Or at least so I thought. Once again we were on a delightful road. Traffic was sparse, we were surrounded by farm country, and gradually the hills petered out. At one point we came upon this magnificent country mansion. 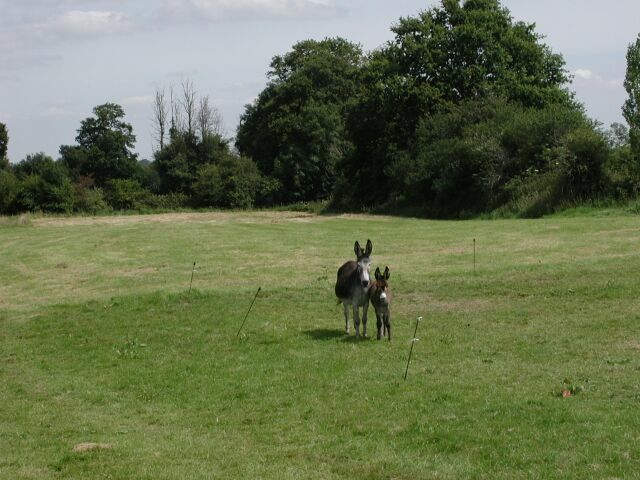 Shortly thereafter we passed by these two curious donkeys, who stared at us placidly. Here's a typical scene on this rural road. After a most pleasant dozen miles or so we joined the main highway for the last three miles into Carentan. Once again the traffic was bad, and for some time I was tailgated by a large tractor that didn't want to pass. Finally, I pulled off the road and waited for it to get far enough ahead. 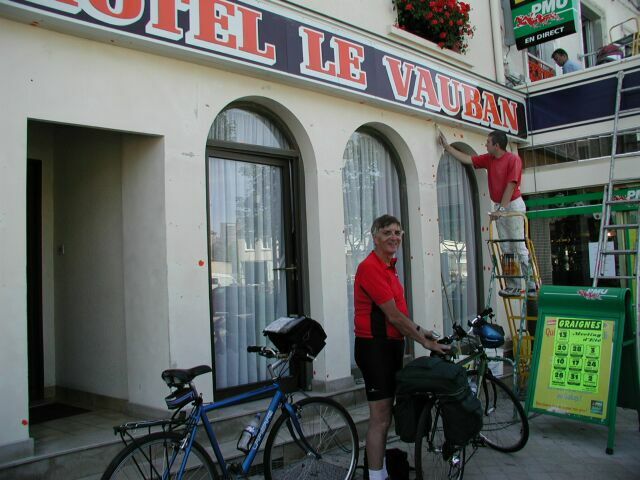 Arriving in Carentan we reached a stoplight at a railroad station where we took a side street towards the main square of the town. The market was just being dismantled, and we saw our hotel on the other side of the square. We couldn't say the hotel was charming, but it had been a long day, and I looked forward to a hot shower. Len went inside while I watched the bikes. He came back out quickly, saying that the woman who ran the hotel was next door. Len went to fetch her, and she spouted a lot of incomprehensible French to us as she gave us our room keys. We nodded like we understood, and she made motions telling us that we could leave our bikes in a garage a block away. Our rooms, as always seemed to be the case, were directly at the top of the stairs. My room looked out on the square, but there wasn't much to see. We went out looking for a restaurant for dinner, but we walked all around the square and sidestreets without seeing a single restaurant. This was obviously not a town for tourists. We walked back towards the railroad station, and across from it we saw what looked like an excellent restaurant. Unfortunately, it was closed -- maybe because it was a Monday. I was beginning to think that we wouldn't be able to get dinner at all, but as we neared our hotel we saw another small hotel that advertised a restaurant. We could see that no one was there, which always makes me reluctant to enter, but we went in and rang the bell at the desk. A man came out and when we inquired about dinner, he asked if we had a reservation. Well, like there's no one in town. In spite of not having a reservation, we were seated in the empty restaurant. We ordered some wine, and I had the duck. As we ate the restaurant started to fill up. There even seemed to be some tourists there, and before we were finished, the restaurant was entirely full. Maybe we needed a reservation after all. Then again, I thought maybe this was the only restaurant in the town. It was this or nothing. After dinner we walked over to the only tourist attraction listed in Carentan -- an ancient church. The church was closed up for the night, but it did look interesting. I thought we had done Carentan, and it was time to sleep.